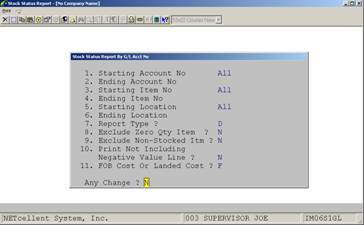 The Stock Status Report is used to print out stock status information about a selected item or range of items by location and product category. The report can be printed for All locations or for a range of locations. 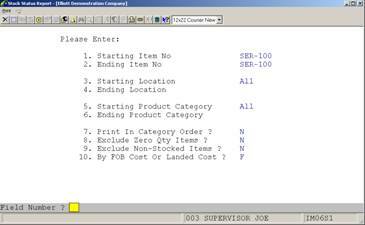 If All is selected, totals are printed for each item which is stocked at more than one location following a full itemization of the quantities on hand, on order and allocated at the various locations. When an item's quantity on hand is below the reorder level for that item at that location the literal REO (reorder) appears to the right of the item on the report. This report does not take into consideration the quantities on order for the different items. 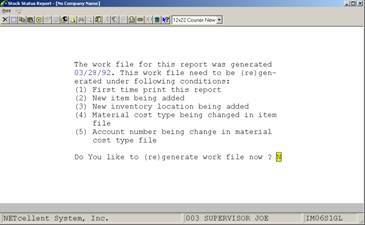 If your company does ordering from individual locations as opposed to central ordering where all orders for a specific item are placed by a single location, this report may be more helpful than the Reordering Advice Report, which assumes centralized ordering when an item's quantity on hand reaches zero, the literal O/S appears to the right of the item on the report. If you are using LIFO or FIFO costing method, this report may also be used to print detailed layer information for each item (out of stock). 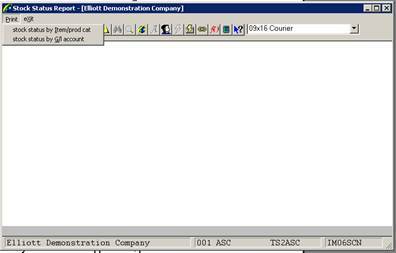 Enter Y if you want to print LIFO or FIFO layer detail for the selected items. Defaults to N.